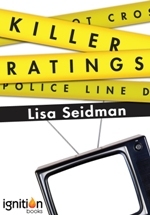 Lisa Seidman began her television career writing for the primetime serials Falcon Crest, Dallas, and Knots Landing as well as Cagney & Lacy, Murder, She Wrote, and Scarecrow and Mrs. King. For five years Lisa was the headwriter on the phenomenally successful, award-winning Russian primetime serial, Poor Anastasia, as well as Sins of the Fathers, Talisman of Love and the Russian adaptation of Betty La Fea (Ugly Betty in the U.S.). She received an Emmy nomination for her work on Guiding Light as well Writers Guild nominations for Guiding Light and Sunset Beach. After a year writing for One Life to Live she returned to Moscow as the headwriter of One Night of Love, which was nominated for an International Emmy Award. Lisa spent two years as an elected member of the Writers Guild of America, West Board of Directors and most recently wrote for the daytime serial Days of our Lives for which she was nominated for an Emmy as well as created a series for Russia, The Most Ordinary Girl in the World. She is currently a writer on a teen soap for Nickelodeon, which will air in the summer of 2012. Lisa: I hope you remember me. I am glad to see that you are still writing. I heard some very sad news today that I thought you might want to know. Judy Morse passed away on November 28th from pancreatic cancer only four months after retiring from Penguin. Was there ever a nicer person working in publishing? Take care.